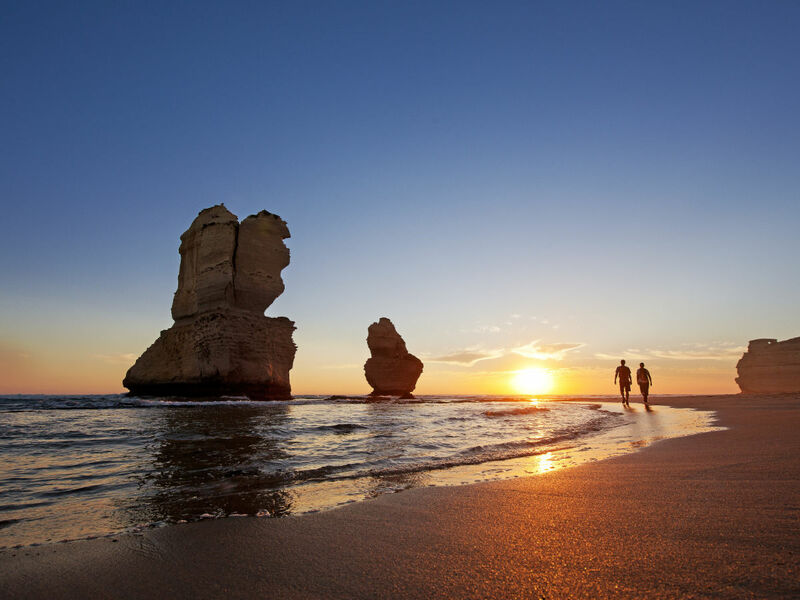 The spectacular Great Ocean Road provides one of the most diverse and breathtaking experiences in the world. Travelling through seaside hamlets and resort towns that hug rugged surf beaches we enter the serenity and tranquility of magnificent rainforests before yielding to the drama of the towering limestone cliffs of the Shipwreck Coast - home to the awe-inspiring 12 Apostles. · Enjoy morning tea on the beach with quality, freshly prepared plunger coffee, specialty tea, hot chocolate and a selection of classic Aussie treats. · Learn how to spot Koalas as we explore their natural habitat - entice the King Parrots and Crimson Rosellas to land on you! · Be awestruck by the sheer limestone cliffs and rock formations of the Port Campbell National Park, including Island Arch and Razorback. · Amaze at the tragedy and heroism as we recount the story of survival at Loch Ard Gorge and head down to the beach to see the cave where the two survivors spent the night alone. Note: Some hotels do not allow pick up directly outside the premises - in which case a nearby convenient location is noted in brackets when selecting your accommodation in the booking form. If your hotel is not listed, please contact us to arrange a pick up time. We do not pick up beyond the city and inner St. Kilda/St. Kilda Road regions for our group tours. Please advise us of any special dietary requirements or mobility restrictions so that we can make your experience as comfortable as possible. Infants (aged four and under) are required to travel in a custom fitted child restraint at all times whilst in the vehicle which we provide (complimentary). Unfortunately due to our seat design, infants 6 months old and younger cannot travel on our tours. Small children (5-7 years old) are required to be fitted in a booster seat, also provided complimentary. There is plenty of room for fold up strollers if you wish to bring them along. Please advise us of your child's age so we can prepare the appropriate seating. Our tours are subject to the following minimum numbers - Great Ocean Road: six, Phillip Island: four. In the event this is not achieved we will provide at least four days notice and assist you in any way we can to secure an alternative. Passenger cancellations within 48 hours of day of departure or failure to show will result in the forfeiture of the full fare. If guests are not present at the designated time, we will attempt to contact your room or by phone if supplied in your reservation. If no contact can be made, we will depart immediately. Cancellations prior to 48 hours will incur a 50% charge of the booked fare. Changes in travel dates within 72 hours of the day of will be deemed a cancellation and a new booking will be subject to the minimum number requirement above. A $25.00 administration charge applies to all cancellations. Rejected credit card transactions will incur a $25.00 fee to cover charges made to us by the bank and additional administration time. For non-Australia issued cards please ensure your bank will allow an international charge to be processed. We reserve the right to change itineraries or cancel tours in the event of unforeseen circumstances and/or guest safety and are subject to minimum numbers. In the event of a cancellation based on the minimum number requirement, a full refund will be applied. Travel insurance is not included and is highly recommended for these reasons.